It's sneak peek time at Taylored Expressions and I've got two cards using new Whimsical Wishes stamp sets, dies and goodies that will be available for purchase on Thursday, October 4th. First up, I've used the 'summer house' from Best Nests. Yes, there's a home and a feathered friend for every occasion in this set! I didn't stamp a sentiment because I wanted this to be a card I could use anytime...happy birthday, thinking of you, miss you, let's get away...when I need a card. I think it's also suitable for either a guy or gal, which is a bonus. I've stamped the image with momento ink; coloured with copics and prismacolors; and popped up the seagull. I've also used one of the new TE Stacklets for my focal image and the TE Chevron Border dies. For my next card, I've combined the new petite Poinsettia Bouquet set with the 'Happy Holidays' sentiment from Sparkle & Cheer. I stamped the bouquet image and cut it out with one of the larger stacklets and coloured with copics and prismacolors. I stamped a second and third image, coloured them, trimmed them and popped them up to add some dimension. I'm thrilled with how the new Quatrefoil Cutting Plate embossed when I used embossing mats instead of the cutting plate sandwich. I'll be using this plate a lot!! So lovely Nancy!! I love these cute birds - seriously the amount of cuteness in this stamp set is amazing!! And your cards are just beuatiful! So striking and lovely!!! Big hugs sweet friend!! Love the birdhouse stamp set! Great idea to cut out the flowers. Wonderful cards, Nancy! I LOVE all-occasion sets and Best Nests is just fabulous! 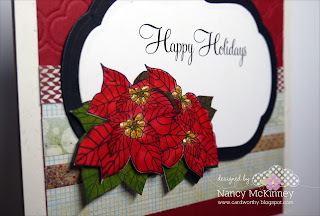 Your poinsettia card is stunning - LOVE the quatrefoil embossed! Stunning cards. Love them and how you did the embossed background. Ohh, your Cards are just Fabulous Nancy! And I am soo Loving working with your stamp sets!! 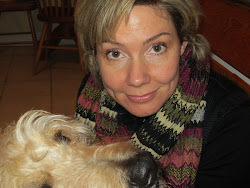 They are always So darned CUTE!! Love the Fab beachy feel of your Best nests card and What a Super idea to pop the poinsettias off the pot! I just might have to snag that idea for a later date, lol! Thanks for the Wonderful inspiration! I just sighed out loud at your birdhouse card! STUNNING design and awesome coloring! LOVE the chevrons with it!! Beautiful cards, Nancy! So cute! These are lovely Nancy! 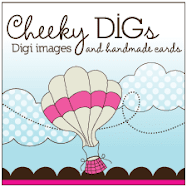 I love how you used the chevron die... that looks great! These look terrific - I just LOVE your illustrations. Thanks for making so many fun sets for us to create with! Absolutely beautiful! I love that you only used a portion of the poinsettia bouquet! 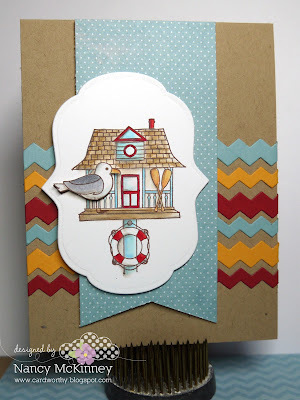 And that bird house is so cute... especially like the chevron background!